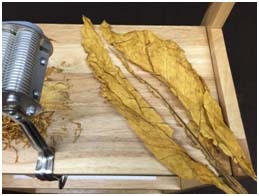 How to Process Whole Leaf Tobacco into RYO Cigarette Tobacco. 1. 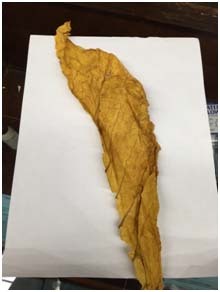 Before shredding your whole leaf tobacco from Leaf Only, remove the entirety of the main stem of your leaf. The easiest way to go about doing this is to pull the stem out and away from the top of the leaf. Grasp right beneath the apex of the leaf, and pull the stem out and down, away from the leaf. 2. After you have removed the main stem, lay out your de-stemmed leaf pieces on a flat surface until they reach optimal moisture level. 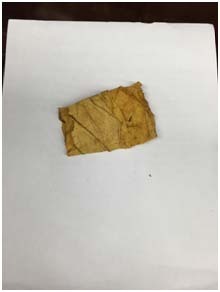 This is achieved when your leaf is dry, but not crisp. 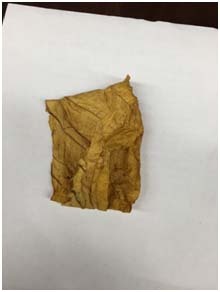 Too dry and your method of shredding could turn your tobacco into dust, which is very difficult to make into cigarettes. Too wet, and your tobacco will make clumpy cigarettes, and bind and damage machines that you run it through. Do not worry! This is not difficult, and you will be able to tell the difference easily after a few tries. 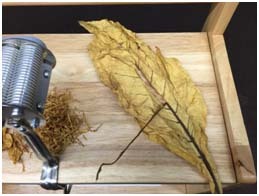 You want the leaf to be dry, but not cracking when you manipulate it. 3. This is the step where you can use a few different items depending your financial situation, time, or desired cut or quality. 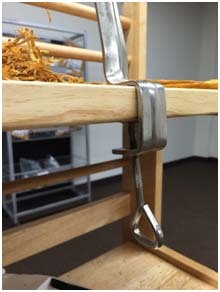 These tools are similar, as they both cut the tobacco in flakes rather than fine shreds or strings. 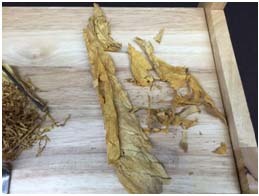 When making RYO Cigarettes, the consistency of your tobacco is very important. You can find all of these for a reasonable price at your local stores. We have used grinders, paper shredders, scissors, and many other items in an attempt to find a decent way to process tobacco leaves. We consider this product to be the Holy Grail for RYO and MYO cigarettes. 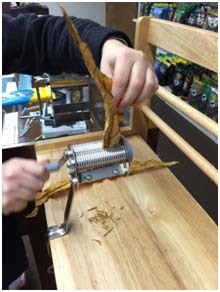 It is an affordable, easy to use shredder that was designed specifically for grinding tobacco leaves. 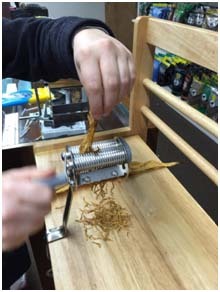 First, start by clamping your Standard Cut Tobacco Shredder onto your table or surface. Second, taking the leaf halves you have made from the aforementioned steps, and run them through the machine one half leave at a time. **Make sure to note moisture level during this step, if your leaf is too moist going in you will clog the machine. Then, break up the longer strands that came out of your shredder. 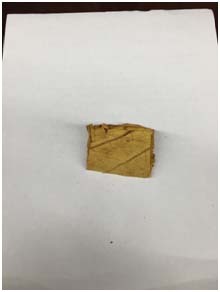 You are looking for pieces between ½ and 1 ½ inches or 10-25mm long. Lastly, depending on your preference, you'll want to run a portion of it through the machine again. Most people re-shred about half of what was first ground. Scissors This is by far the most affordable option there is, but is also the most labor intensive. 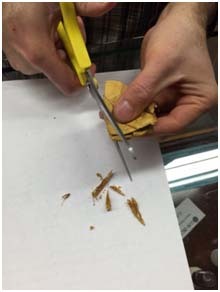 To start, take the halves you've made by removing the main tobacco stem. Then take a few and stack them flat then fold them in half. After that roll it up and tuck any excess ends in. What you do next is take your scissors and cut on a 45 degree angle. 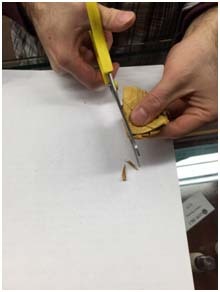 Make sure when you cut to get as deep in the scissors as you can as it makes a easy cut and more control. Now it's all preference on how fine you enjoy it, I recommend 1-2mm. 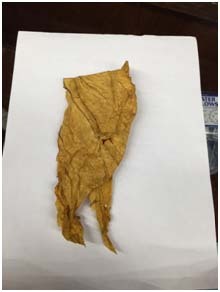 Lastly, just like before, break up your tobacco into smaller strands. That’s it! 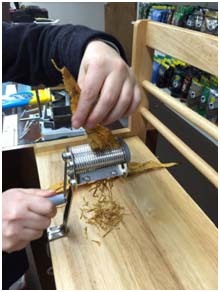 As you can see, it’s incredibly easy to shred your whole leaf tobacco! 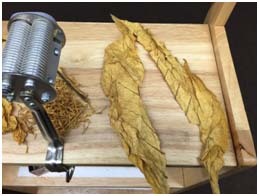 All you need to do now is Make Your Own Cigarettes with Leaf Shredded from Leaf Only!